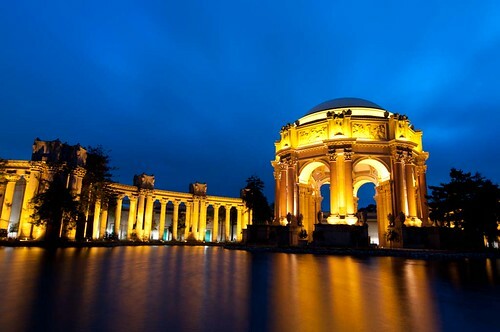 Palace of Fine Arts in blue hour. … Ok, I’ll admit – I’m a sucker for blue hour shots. I can’t seem to get enough of it and neither do I get tired of seeing them :). This place was fenced off due to some construction/renovation work and now its open. The inside of dome is gorgeous. I was waiting to get a shot of this magnificent structure in blue hour and the timing of RadiantScape’s Beginner’s workshop was just perfect. The Palace of Fine Arts was one of ten palaces at the heart of the Panama-Pacific Exhibition, which also included the exhibit palaces of Education, Liberal Arts, Manufactures, Varied Industries, Agriculture, Food Products, Transportation, Mines and Metallurgy and the Palace of Machinery. 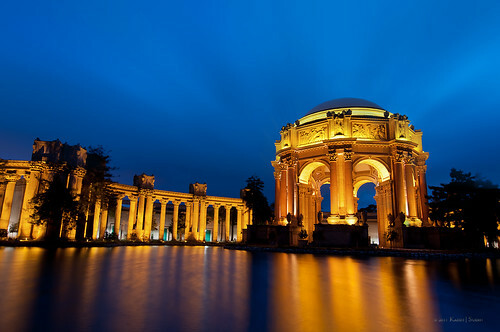 The Palace of Fine Arts was designed by Bernard Maybeck, who took his inspiration from Roman and Greek architecture in designing what was essentially a fictional ruin from another time. While most of the Exposition was demolished when the Exposition ended, the Palace was so beloved that a Palace Preservation League, founded by Phoebe Apperson Hearst, was founded while the fair was still in progress. You can get more info on it on Wikipedia. Used Lightroom 3 to convert the raw image to tiff with adjustments to white balance and exposure settings. Converted a lesser exposed image for the highlight areas. Used both the images in Photoshop as layers and masked in the highlight areas. Added a spiral blur to the sky to give a slight streaking effect. Resized the image for web. Applied selective sharpening for the structures using smart-sharpen. Saved as 8 bit jpeg and added metadata, keywords through Bridge.